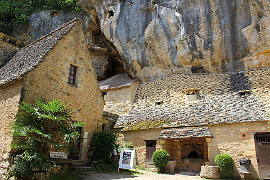 Laugerie-Basse is a rock shelter used by prehistoric man in the Cro-Magnon period (about 14-24,000 years ago). 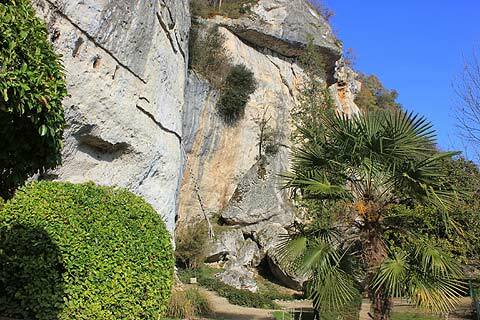 It can be found a little to the north of Les Eyzies and is adjacent to the natural cave of La Grand Roc which contains a superb stalactite display. 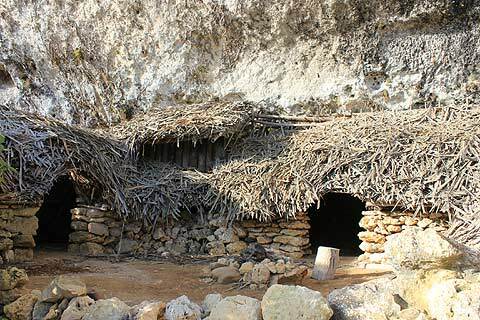 At the start of the visit to Laugerie Basse there is a short film introducing the Cro-Magnon period and the discovery of the Laugerie Basse shelter. It is quite an interesting film and makes quite a useful introduction to this period of history. 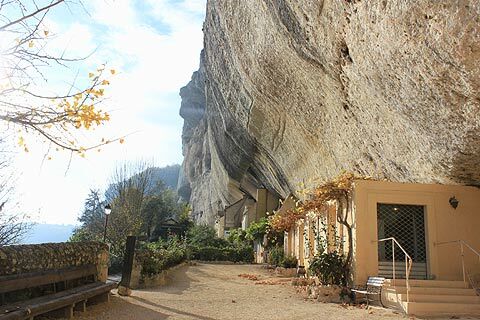 The shelter itself is a naturally formed cave which has been worn into the rock by eroding waters and as it has deepened rock has fallen from above blocking the front of the shelter and providing additional protection from the weather and animals. It is about 100m long and 60m high. There is even a natural water source in the shelter. As well as the shelter there are markers on the rock showing the different periods of pre-history exposed in the different coloured layers. There are also copies of important finds, found as the area was excavated. These include the famous 'Venus Impudique' (Immodest Venus) which is the first statue of a woman to be found in France. 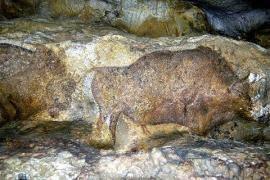 It is carved out of the ivory tusk of a hairy mammoth. As well as 'Venus Impudique' many other fine carvings were found at the site such as the head of a horse and a carving of a salamander. Often the carvings decorated tools such as spear-throwers. The quality and diversity of the decorative articles found in this site is amazing, there are more than 500 such pieces. 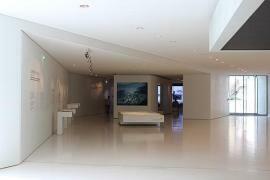 The art ranges from geometric patterns to figurative art. 18 different animal species are represented with oryx and bison being the favourites but also many drawings of horses. There are also many drawings of fish - especially salmon and trout, the neighbouring Vezere river perhaps providing the inspiration. The grave of a man was also found at the site, buried with shells as was often the way at that period. 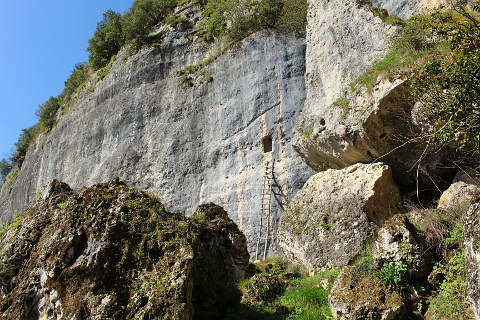 Outside the shelter you will notice a rickety ladder which leads up to a hole in the rock face which was used as a look-out post. Laugerie-Basse was discovered by Edouard Lartet and Henry Christy in 1863. Sensible excavations continued for a few years but without the care of a modern day dig. The site then unfortunately fell into the hands of a Swiss man, Otto Hauser, who in his rush to exploit the site even used explosives! Otto Hauser sold all his finds to the highest bidder meaning that many of the important finds from Laugerie Basse are spread throughout the world. 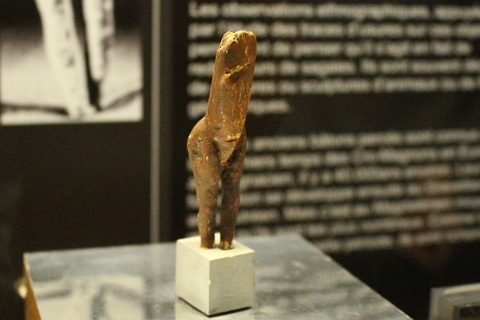 However many of the finds are on display at the Prehistory Museum at Les-Eyzies. 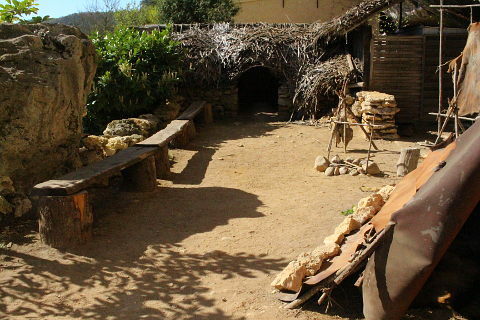 Happily in 1912 the site was put back onto a more scientific footing and Jean Maury carried out a detailed and systematic study which revealed occupation of the shelter over four different Magdalenian phases. 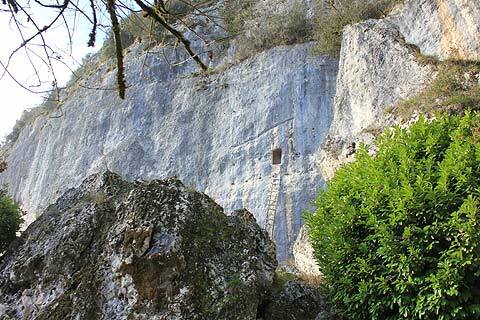 Whilst he was working at Laugerie Basse, Jean Maury noticed a terrace higher up the cliff face nearby. He climbed up and noticed a small spring. 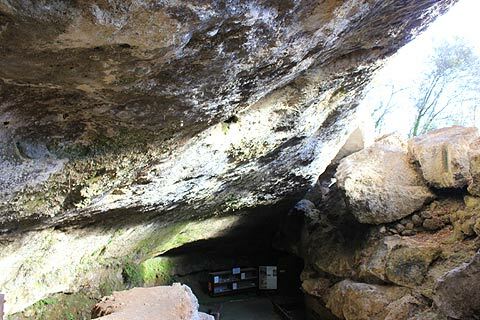 He set to, with his sister and daughter, to discover the source and after two years of digging out a passage they discovered the Grotte du Grand Roc. 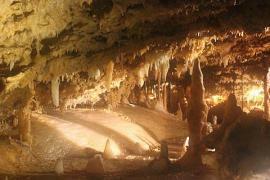 The caves are open every day from February to the end of December. Over 12s 8.30 euros, 5-12 years 5.80 euros. If you are visiting with children they can borrow a tablet and carry out a "virtual dig" as they walk round the shelter. There are various points in the shelter which trigger the tablet to enable an on-screen excavation to discover the prehistoric treasures. 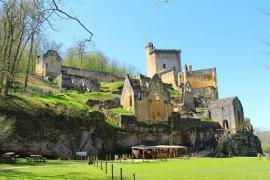 Evening Visits to sites in the Dordogne are becoming increasingly popular and Laugerie-Basse and the Grotte du Grand Roc are both open Monday nights in July and August. They open at 8.00 pm and the visit takes about 1 1/2 hours. 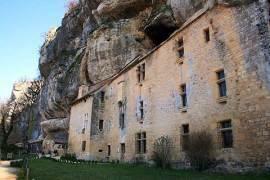 The visit costs 15 euros for adults and 9 for children. This is a combined visit of the two sites. 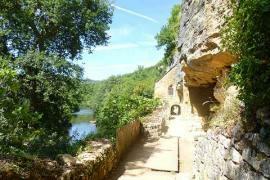 The natural cave of the Grotte du Grand Roc is next to Laugerie Basse and shares the same ticket office. If you visit both at the same time you get a reduction. 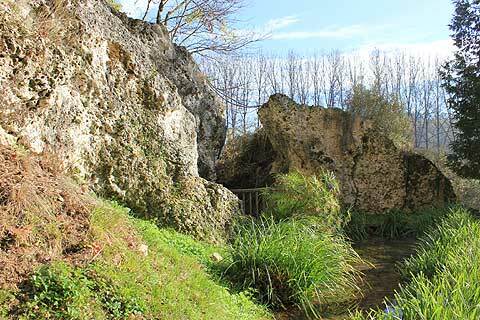 Les Eyzies is a kilometer or so to the south of the caves and is at the centre of dozens of natural and pre-historic caves and home to the pre-history museum where you can see many of the finds from the Laugerie-Basse shelter. 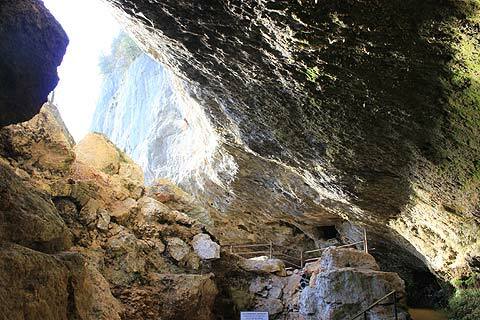 The nearby Grotte de Font de Gaume is one of the last caves containing prehistoric cave paintings still open to the public.